Most bloggers have recently faced an issue with Adwords Login while searching for the keywords specifically by using Long Tail Pro, which is considered as the best search tool for keywords. There are many users in multiple forums that have been making a fuss about Long Tail Pro. They have claimed that it is not working up to its expectations and that it is not searching for the keywords properly. The reason why it is not working properly for such users is because they have not done some configurations the right way, and they must be done properly to make full use of Long Tail Pro. Following are some steps that need to be followed accurately in order to tackle the problems. The first thing you need to do is make a new account by going to the Adwords site. You will see a Get Started option where you have to click. There is one caution that you must take now and it is that you should avoid using your existing Gmail account to log in the Google Adword. Make a new account using some different email address other than Gmail. Once you have provided the email address, just login in the email address and accept the verification details. Once you have followed through the verification process, go on to your Google Adword profile and modify the currency and time. The currency should be kept as US dollars and the time must be set to US Eastern Time. Once you have done these modifications, logout the Adword account. This step is necessary, so do not ignore it. After logging out the Adwords account, open up the Long Tail Pro and go to settings. Go to the add campaign button and create a search campaign for the keywords that you desire. Once the campaign is created, put in some keywords and then generate them. This is the point where Long Tail Pro should ask you your Adwords login details which you just verified few minutes ago. 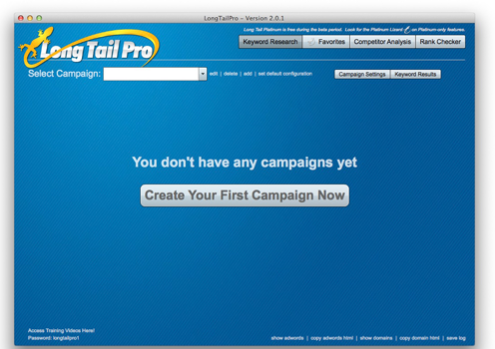 Use those details in Long Tail Pro and save them as well so that you do not have to enter them again and again, or run a risk of losing them. If you wait for some time, you will notice that the software will start working according to the criteria you mentioned. If the Long Tail Pro is still not working properly, just restart it and it will work just fine. By following the steps mentioned above, you can easily solve the issue of fetching keywords. What is the login name and password in VMware Server 2.0? hi, thank you for this solution. It turned out it didn’t work for me. Long tail kept trying to login again and again… But after a lot of trials and errors I decided to go change a setting directly into my google adword account. The language of my account was set as “french”. I changed it to “english US” and then it worked like a charm. for me also, it works ny changing the language of the google account. not working for me. Fetching of keywords is endless…any other solution, please? It is still not working for me, It keeps on asking Adwords details again and again in a constant loop. Please help with some other trick. Great Man ! Work here! salut, je vous remercie pour cette solution. Il est avéré qu’il n’a pas fonctionné pour moi. Longue queue a continué à essayer de se connecter encore et encore … Mais après beaucoup d’essais et d’erreurs, je décide d’aller modifier un paramètre directement dans mon compte adword google. La langue de mon compte a été défini comme “français”. Je l’ai changé pour “anglais américain”, puis il a travaillé comme un charme.